Even though I passed out on the sofa early, woke up at 11:50 (just in time to say “Happy New Year”) went back to bed, and then woke up (without a hangover) at 5:30AM! Why? It’s another beautiful, sunny day in Northern California. I could say that 2018 “just flew by,” but that's how it feels to me literally every year now (pretty much ever since I had a beautiful baby that now can wear my tops). Speaking of Devon, we’ve been spending a lot of time together since I got to take the 2 week Winter break with her (no more wedding gowns, YAY!) I decided to do NO SEWING at all for 2 weeks…just organizing…Super Crazy Organizing! I’ve been pulling everything out of the bedroom and hallway closets, all the junk drawers in the kitchen, the bathroom vanity….so many things…and I’ve come to really realize (and admit) that we are low-key hoarders. I have SO MUCH FABRIC, it’s insane. It’s ok though, because I’m documenting the before and after (which is always really fun to look at) and I’m going to put my OCD into proper use by being extremely organized in a really “satisfying to look at” way. I mean, why waste that on doing pointless never ending “to-do” lists when I can steer my OCD into decanting my kitchen and bathroom? So, I bought the book “Remodelista: The Organized Home” for tips and inspiration and went crazy. Now I have 1 more week of total organizing time and I still have 23 bags of fabric scraps and paperwork to go through…but I’m going to do it by tackling 4 or 5 bags a day, and I’m going to force myself to post the before and after pics here. Hopefully that will ensure that this finally gets done. Devon's been doing her part by going through all her toys, books and clothing to figure out what she wants to keep, donate or throw away. We take breaks often and go on walks downtown to get Boba. Besides my “being super organized” resolution, my others are to spend more time with Isaac and Devon. My plan for that is mainly dinner focused. For example: Devon will be helping me put dishes away, she’s going to eat with me at the table (Instead of her desk ) Isaac and I will have dedicated dinner and lunch dates etc, etc, and that automatically knocks out my other resolution, which is to make healthier dinner choices …so perfect and easy to do when you now have a beautifully decanted and reorganized kitchen….hmmm.. so really, it’s all about food this year for me, I guess…how about you? I work with a lot of private clients on special occasion looks like wedding gowns, event pieces etc. I usually don't blog about the process (just posting a final image on my IG or on Facebook) however this client had a particularly interesting request, which turned into a really creative collaboration between designer and client. I met said client at a draping workshop event that I had at Britex a few years back. She had several bridesmaid dresses (5 to be exact) all in quality fabrications, but none of which she could ever see herself wearing again. She thought that maybe I could salvage enough fabric to cut entirely new garments out of them and was expecting to have to purchase additional yardage of contrasting fabrics to complete each look. She made an appointment to come to my workspace and brought the dresses for me to "play around" and see what ideas I could come up with. 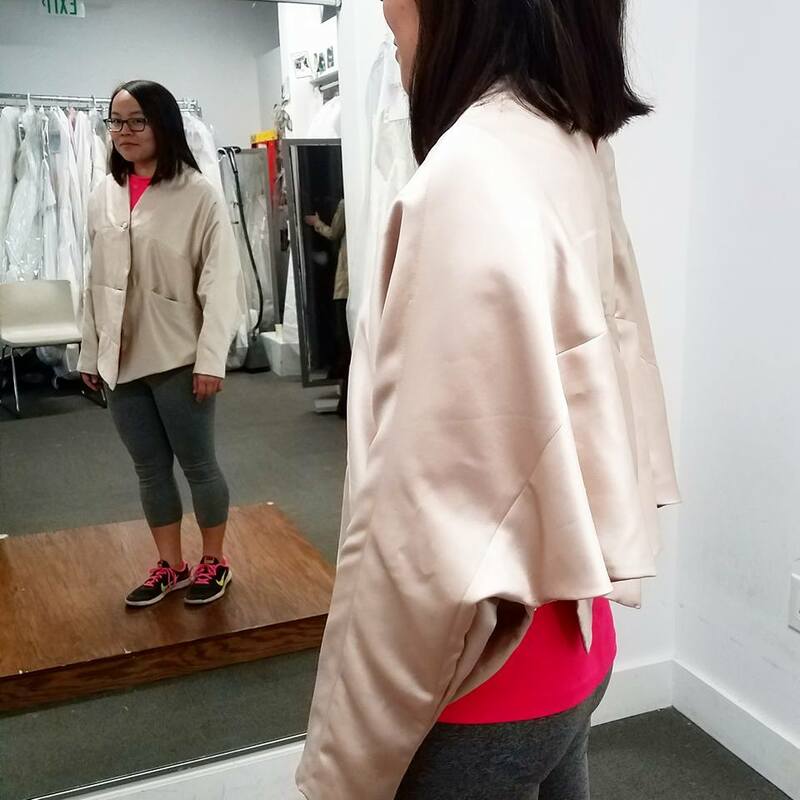 She had a sort of "tech" conservative day look, but I really had no clue about her personal style, so I asked her to put together a mood board of looks that she found appealing on Pinterest. The board, to my happy surprise was full of edgy/Japanese inspired structural/minimalist looks. Armed with this knowledge and the fact that she appreciated my draping skills, I decided to come up with "new life" pieces, not by cutting into the fabrics to make entirely new items, but by flipping the garments around on my dress form and being inspired by certain elements of the pieces original construction to be utilized in a new way. 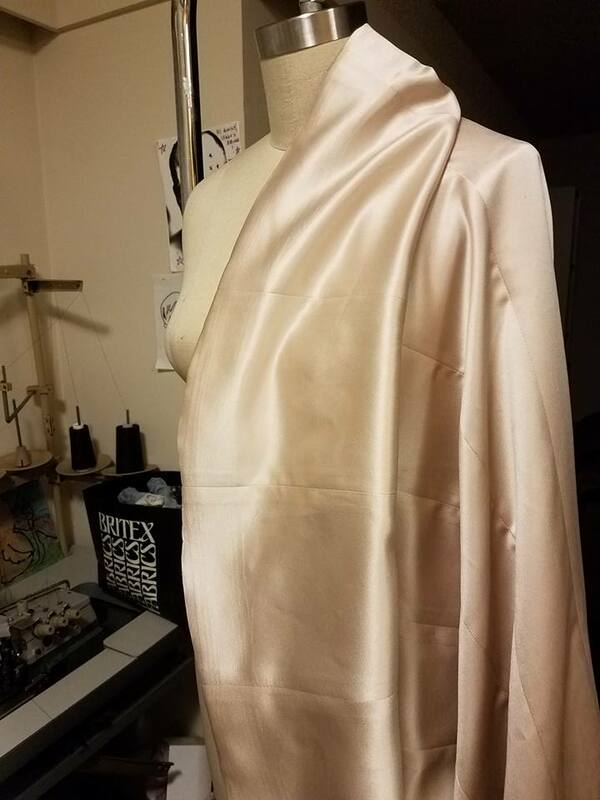 The first piece I completed began as a dusty pink satin Vera Wang strapless gown. The design element that I found to be most interesting was the hem, which was fully edged in wide horsehair trim. I immediately flipped the gown upside down utilizing the original hem to create a super structured neckline on what would eventually be her new jacket. I then sliced the dress in half to come up with the other side of the jacket and used the original seaming to create buttonholes and a pocket. The resulting look is a very "edgy" piece that can be easily dressed up or down and is incredibly comfortable and most importantly, wearable.